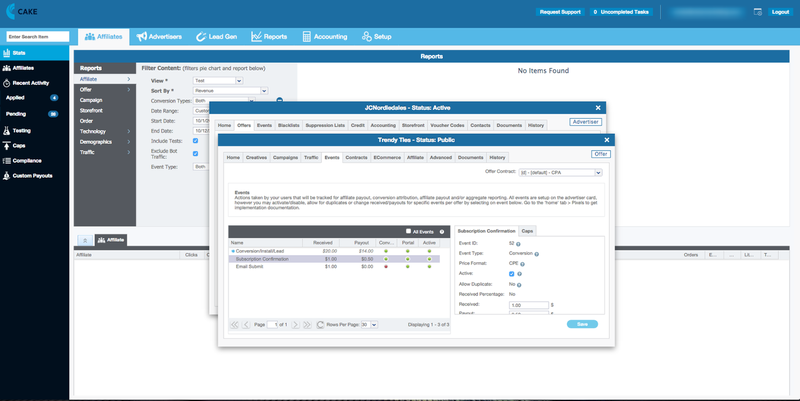 Events are user actions that can be tracked pre- and post-conversion or application install. They are a great way to track steps within a funnel, free trial signups, in-app purchases, returning customers and so much more. Events can be revenue impacting actions or simply used for gaining insight into customer behavior. In order to create Events, this feature first needs to be enabled within CAKE's Global Settings. Click on the Setup maintab. 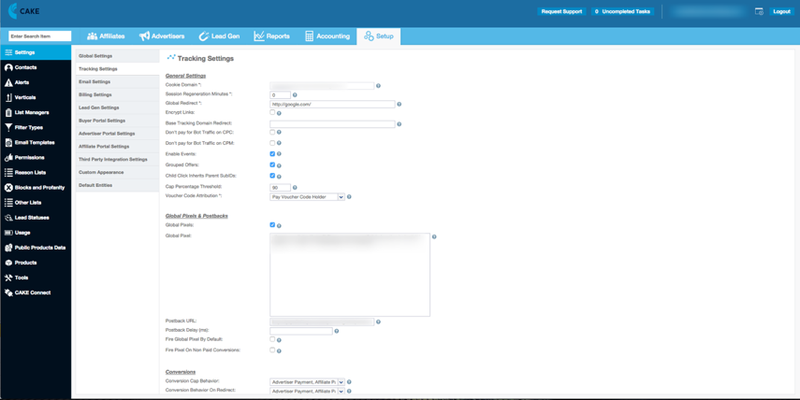 Click on the Tracking Settings sub tab of the Settings left navigation panel. Check the box next to Enable Events under General Settings. Click Save on the bottom of the Settings grid. Events are created on the Advertiser level so that they can be easily applied to each of your Advertiser's Offers because most Advertisers will track the same user actions across Offers. 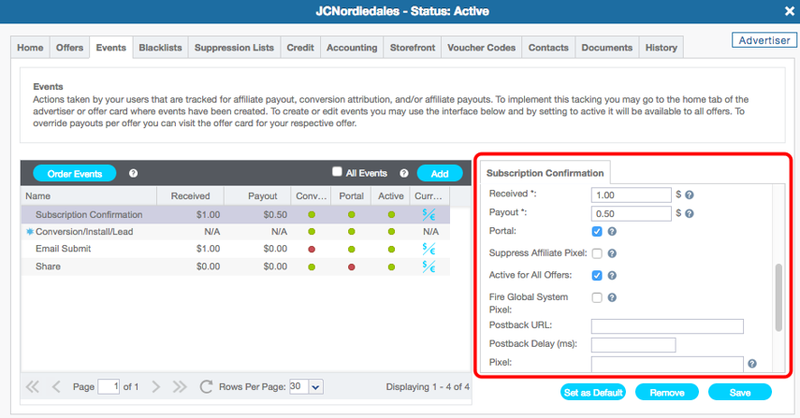 Note: A default Conversion/Install/Lead Event will display for the Offer in the scenario where no additional Events are being tracked for that Advertiser. Assign a Name to the Event. Select the Price Format, Cost Per Event (CPE) or Revshare. The Active checkbox is selected by default and allows this Event to be applied to this Advertiser's Offers. If the Allow Duplicate setting is enabled, CAKE will track the same Event for a user each time the Event pixel is received. Enabling Ignore Duplicate Transaction IDs will appear when an Event is selected to be edited, which will ignore Event pixel fires that contain a Transaction ID value that has already been captured for a previous Event or Conversion. If your Received amount will be a percentage of a dynamic price passed in the Event pixel, enable the Received Percentage setting. Input your Received amount (revenue) per tracked Event into this field. Assign the default Payout to the Affiliate for the tracked Event. 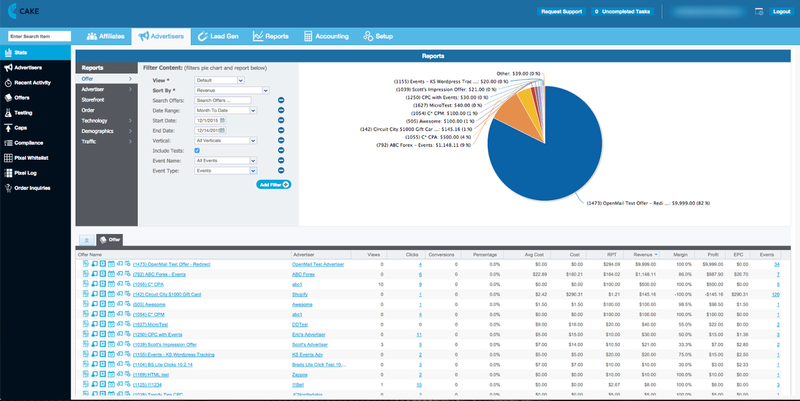 If you would like Affiliates to view this Event and its stats in the Affiliate Portal, enable the Portal setting. Enabling Suppress Affiliate Pixel will suppress any affiliate pixels from firing/piggybacking when this event is tracked. Enabling Active for All Offers will make this Event active on all of the Advertiser's Offers and Campaigns. If you would like to fire a Global System Pixelwhen this Event is tracked, please enable the Fire Global Pixel setting. Postback Delay (ms) - This allows you to select a delay period (in ms). This will allow your Global Offer Pixel to fire prior to the Postback URL. Pixel - This is where you can place a Global Event Pixel which will be called with every Event pixel. When Ecommerce Payout Rules are being used, if the Event Payout/Received Trumps Other Sources setting is enabled, Event payouts will override the Offer's Payout Rules. Click on the Create/Save button to create or save your settings. Once all steps have been completed in the Event creation, an Event ID will be assigned which is visible under the Event details. Note: Events do not need to occur in a specific order, however, if you wish to order Events for reporting or management purposes, click on the Order Events button. Once Events have been created on the Advertiser level, they can be applied to Offers associated to that Advertiser. From the Advertiser card, Click on the Offers tab. Click on the Name of the Offer to open the card. Click on the Events tab on the Offer Card. Click on the Event Name. Offer level Event Caps, similar to Click and Conversion Caps, can be configured from the Events tab of the Offer card. Click on the Caps sub-tab. Select the Event Cap Interval: None, Daily, Weekly, Monthly or Custom. By default, CAKE will not redirect traffic when an individual Event Cap has been reached as there may be other Events or Conversions that still have allocation. However, you can choose to redirect traffic once an Event Cap is reached by checking the Redirect When Cap is Reached box. Note: The following Event Cap Alerts can be set in the Alerts sub-tab of the Setup maintab. 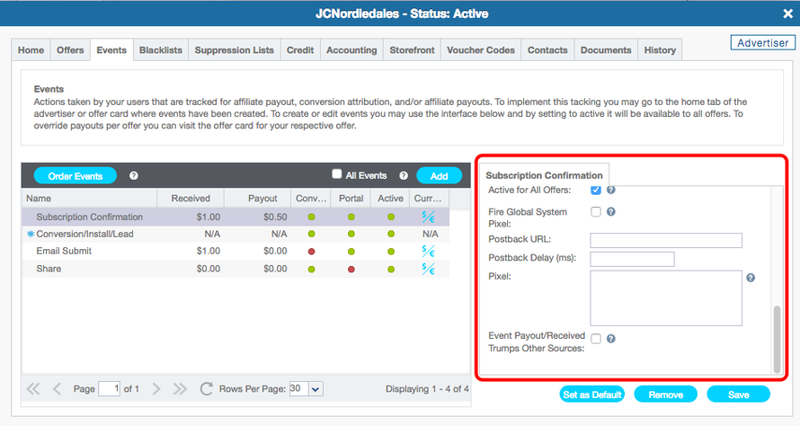 Events details can be customized per Affiliate's Campaign, such as Status, Payout, Affiliate Pixels and Caps. From the Offer card, click on the Campaigns tab. Click on the Campaign Name to open the card. Click on the Events tab of the Campaign card. Note: If your Affiliate has a Conversion Pixel placed that he/she would also like to use for tracking Events in another system, check the box for Use Campaign Default Pixel. Select the Event on the wizard. Click the Pixel type you wish to use. Include Request Session ID: Selecting this will append "r=REQUEST_SESSION_ID" to all HTML Pixels, whereas by default, that parameter would only be included on the Postback URL. This solution is recommended when there is a concern about users having cookies disabled on their browser. Without a valid cookie, CAKE can convert the user based off of the Request ID value, similar to Server-to-Server tracking. Ecommerce Parameters: If the Ecommerce license is enabled within your instance, this option is displayed. Enabling this checkbox will append all CAKE Ecommerce parameters to the generated Event pixels. Email to Advertiser: If this box is selected, an email containing the generated Event pixels is sent to the Advertiser's contact(s) email address after selecting Finish on the last step of the wizard. 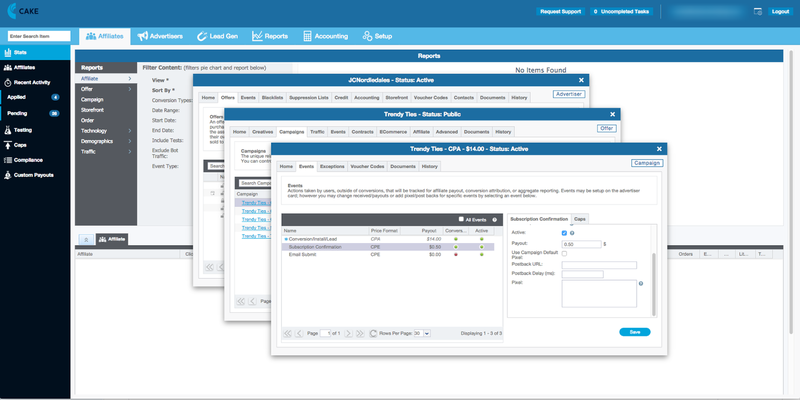 Events are visible in most Reports by adding Columns, Filters and Drill-downs within the Edit View wizard. One example is the Advertiser Master Report found under the Reports main tab or the Stats sub-tab of the Advertiser main tab. When the Events column is added to a Report, the number of tracked Events will show a hyperlink that opens a break-out Event Conversion Report. 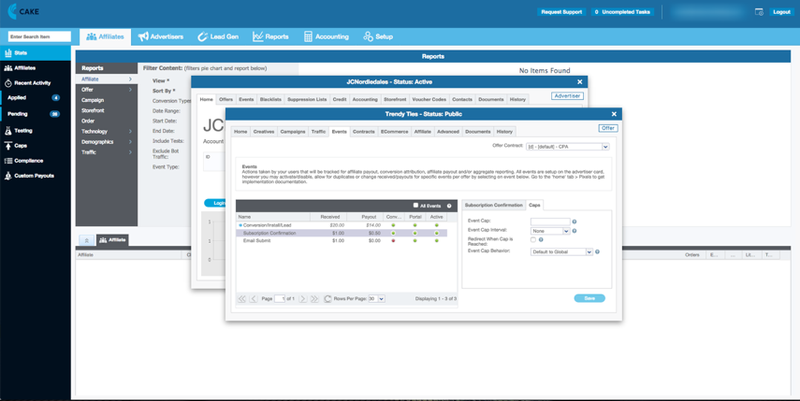 From this report, you can open the individual Event card to see details such as the Consumer's History, Payout to the Affiliate and Pixel details.